Peaches and cheese a match made in heaven! I remember the first time I tasted grilled fresh fruit – it was pineapple – and I was so excited, knowing it opened up a whole new realm of delicious possibilities for recipe development. 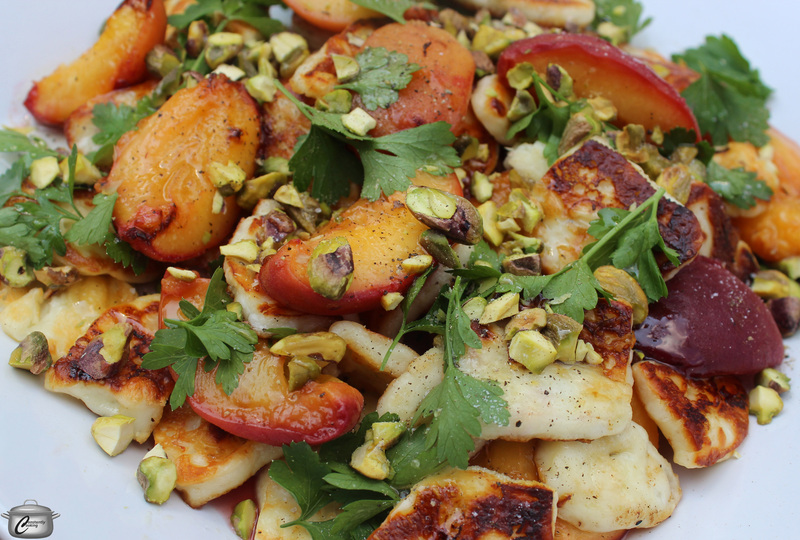 In this salad, fresh peaches and squeaky, salty halloumi make a delectable combination, whether you grill them or crisp them up in a cast iron pan on the stove. If you have never tried halloumi, a semi-soft, brined, salty cheese that hails from the eastern Mediterranean, you’re in for a real treat. It’s got a high melting point which makes it ideal for grilling – you can get the outside nice and crispy, yet the slices will still hold together and be soft on the inside. Feel free to play around with this basic recipe – swap in arugula for the parsley, or add a dash of balsamic if you like! Preheat a grill pan on the barbeque, set to medium-high. (Alternatively, you can also use a large cast iron frying pan). Put the peach wedges in a small bowl and mix with 1 tablespoon of olive oil. Transfer the peaches into the grill pan and cook for 3 – 5 minutes until slightly softened and a few char marks are visible on the fruit. Remove the peaches to a serving platter. Put the halloumi slices in the same bowl that the peaches were in and drizzle remaining oil over top. Lay the slices on the grill pan and cook for 3 – 4 minutes per side, until nicely crusty. Add the cheese to the peaches along with the parsley. Drizzle honey and squeeze lemon juice over top and toss gently to combine. Finish by sprinkling with salt and pepper as well as chopped pistachios. Serves 4 and can easily be multiplied. 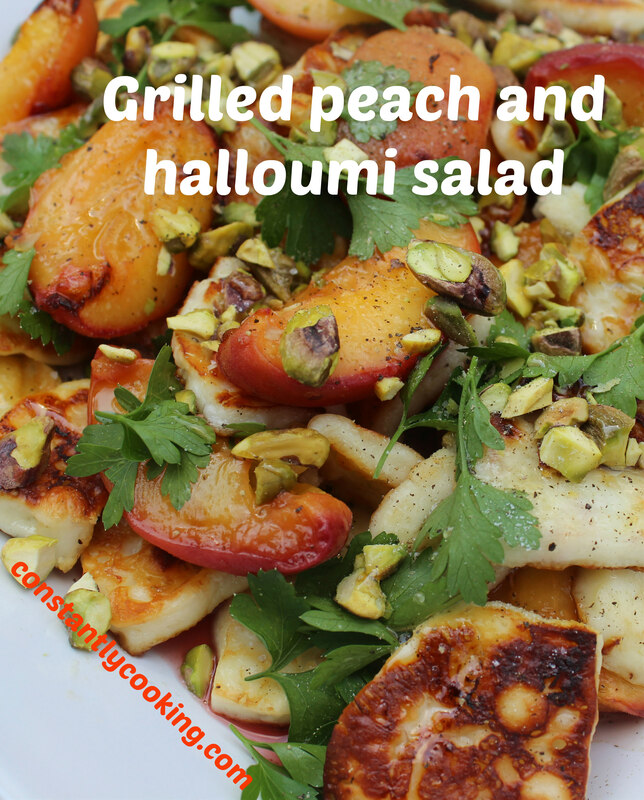 This entry was posted in barbeque and tagged grilled fruit, halloumi, how to cook halloumi, Paula Roy, peach salad, peaches, pistachios, salad, summer entertaining, summer salad, what to make with peaches. Bookmark the permalink. Thank you! It sure is!